The Great American Eclipse is inspiring a great frenzy, with millions of people preparing to get the best look possible as the moon covers the sun on Monday. All of North America will be treated to at least a partial eclipse, with a full eclipse visible in 14 states. Are you ready for the spectacular sight? The biggest thing to remember is to never look directly at the sun without the proper protection. Eclipse viewing glasses with solar filters and ISO 12312-2 certification are the only safe way to look directly at the sun. DIY solar filters are not recommended. “People have done a lot of strange things — they take a glass with like tea in it or coffee or something to put in front of it. Not safe,” said Sean Brittain, an associate professor of astronomy and astrophysics at Clemson University. Looking through a dark beer bottle or spray-painted glass also won’t protect you. By the way, astronomers who teach kids about eclipse safety have heard it all. “One of the little girls at the schools asked if her dog needs eclipse glasses,” said Andrew Garmon, a graduate student in Clemson University’s department of physics and astronomy. For the record: no. Animals know better than to look at the sun and may actually use the darkening sky as a sign to nap. That’s also not safe: The concentrated solar rays will damage the filter and enter your eyes, causing serious injury, NASA warns. Solar filters must be attached to the front of any binoculars, telescope or camera lens. Never use small solar filters that attach to the eyepiece, as is the case in some older, cheaper telescopes, the agency adds. “If the filter is attached to the spot where you place your eye, sunlight concentrated by your optics will burn right through it,” the American Astronomical Society cautions. If, and only if, you are in the thin path of totality — where day will turn into night for about two minutes — it’s OK to take off your eclipse viewing glasses during the brief time when the moon fully eclipses the sun. You’re safe then, and you can soak in the spectacular sight. The instant the totality is over, immediately look away and put the special glasses back on. Experience the universe putting on a show with your own eyes rather than spending precious time trying to capture a photo. Put away the screen for once and really enjoy what’s unfolding around you. That’s especially true if you’re in the path of totality. Yes, professional photographers will be able to get amazing pictures, but they have special equipment, training and experience, and they’ve likely practiced exactly what to do. Your photos won’t be the same. If you insist on taking a picture, experts recommend that you don’t try to photograph the eclipse with a smartphone and go with a point-and-shoot camera mounted on a tripod, and protected by a solar filter, of course. 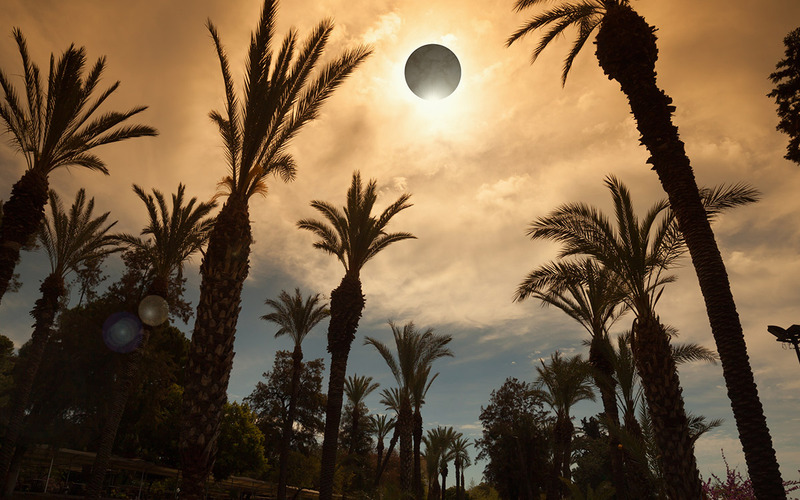 If you’re in the path of totality, the celestial show will alter your surroundings in amazing and eerie ways, said psychologist Kate Russo, who travels the world seeking out total solar eclipses to study how they affect people. “There are changes in the environment, the temperature has dropped, the wind has picked up, the light is really wrong and then that approaching shadow is just so wrong and exciting and euphoric,” Russo told TODAY. First-timers have no idea that the world can exist in this particular way, so stay in the moment and take in everything around you, she advised. You’ll remember it for the rest of your life.